This podcast is a collaborative project between the IWK Health Centre in Halifax and Capitalize for Kids to improve health outcomes for children and families across Canada. Each month, we host a webinar featuring a high priority topic in child and adolescent mental health and addictions. Experts will share best practices and answer questions from clinicians across Nova Scotia. It’s important to note that the practices discussed in this podcast are sensitive and only intended for qualified and trained mental health professionals. Our topic for this episode is about working with Trans* and Gender Diverse Youth. We’ll hear from Dr. Suzanne Zinck from the IWK Health Centre who will discuss the basics of the 5 elements of care and will use a case study to illustrate the concepts discussed. It’s important to note that practices discussed in this podcast are sensitive and only intended for qualified and trained mental health professionals. This podcast is a collaborative project between the IWK Health Centre in Halifax and Capitalize for Kids to improve health outcomes for children and families across Canada. Our topic for this episode is Adolescent Concurrent Disorders. We’ll hear from Dr. Selene Etches from the IWK Health Centre who will discuss working with pre-contemplative and contemplative youth with concurrent disorders. 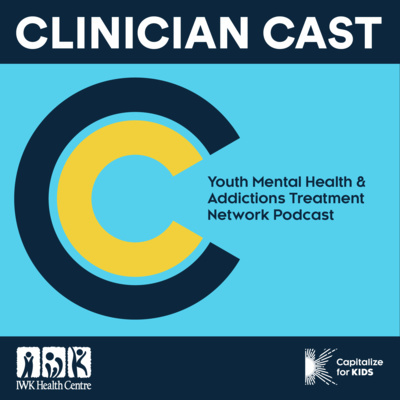 It’s important to note that practices discussed in this podcast are sensitive and only intended for qualified and trained mental health professionals. This podcast is a collaborative project between the IWK Health Centre in Halifax and Capitalize for Kids to improve health outcomes for children and families across Canada. Our topic for this episode is Adolescent Eating Disorders Diagnosis and Treatment. We’ll hear from Dr. Brynn Kelly and Jessica Wournell from the IWK Health Centre who will discuss family based treatment for adolescent eating disorders. They will use a case study to illustrate the concepts that are discussed. It’s important to note that practices discussed in this podcast are sensitive and only intended for qualified and trained mental health professionals. This podcast is a collaborative project between the IWK Health Centre in Halifax and Capitalize for Kids to improve health outcomes for children and families across Canada. Our topic for this episode is The Psychosis Continuum. We’ll hear from Dr. Sabina Abidi and Laura Carnegy from the IWK Health Centre who will discuss early intervention strategies for youth presenting with psychotic experiences who may be at risk for illness development. They will also review the course of illness of a youth presenting with early signs of psychosis symptoms including differential diagnosis using a case-base model. It’s important to note that practices discussed in this podcast are sensitive and only intended for qualified and trained mental health professionals. This podcast is a collaborative project between the IWK Health Centre in Halifax and Capitalize for Kids to improve health outcomes for children and families across Canada.